I have been coming across information on what seems to be a steam shovel acquired by the CP about 1872. It shows up in two SP documents of that time. This piece of equipment remained in used into the next year. On February 17, 1873 Assistant Superintendent AC Bassett recorded in his journal: “steam excavator through cut at Sand Cut and hauled off.” This is the last mention of it in the journal. I assume the unit was returned to the Central Pacific. ... I recently saw a photo of a rather curious Central Pacific consolidation. It was apparently an enlargement of a builder's photo, and the locomotive pictured was named " Schenectady ", and numbered 2012, evidentally having been built by the locomotive works of that name. It had a fairly large boiler, rather small ( 57" ? ) drivers, a steel cab, a single stage air compressor on the left side about 2 or 3 ' ahead of the cab, and arch bar trucks under the tender. The roster which I have goes back to 1900, and does not list this locomotive, at least not by that name or number. Based on what I have described, my best guess would be that it was built sometime in the 1890's. Could you help me with info. regarding date of manufacture, and any subsequent renumberings or rebuildings? How much of the Central Pacific route, Sacramento to Ogden, eventually received double track? Without doubt, it all received automatic block signaling in the Teens and the Twenties, but how much of it received Centralized Traffic Control, and where was it operated from? From time to time I have the opportunity to work with computer illustrator Jon Davis (jdavis7511@comcast.net) in recreating virtual models of steam locomotives. Jon's work is extraordinary and his drawings faithfully recreate these machines with a high degree of accuracy. 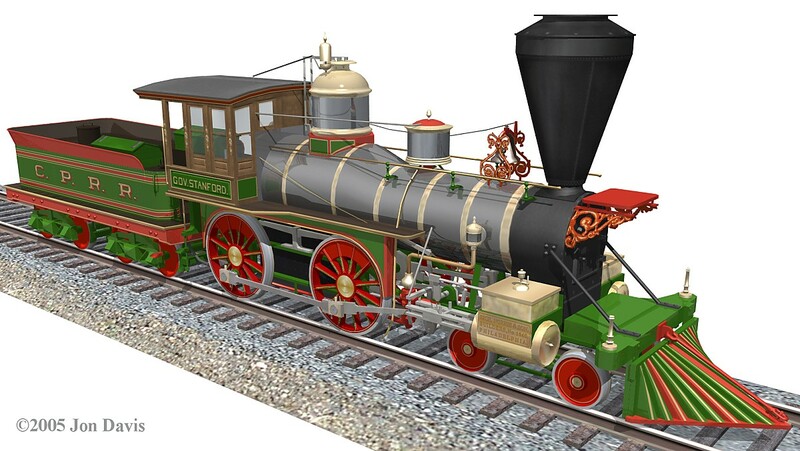 Jon and I are currently working on several 19th century 4-4-0s, some of which ran on the Central Pacific. One of these, Governor Stanford No. 1, is attached. Governor Stanford represents a standard American locomotive of 1862-63, built by Richard Norris & Son, an established Mid Atlantic builder and the largest in the United States. Norris locomotives were highly regarded for their working ability, and I believe there is commentary on the Central Pacific that supports this. Its design and finish reflects the vernacular tradition that made up one school of locomotive design at the time, and proves to be better looking than previously thought. Jon's drawing represents the locomotive as it appeared when new. The drawing is based on two photographs of the engine in construction service on the Central Pacific, the surviving locomotive, and photographs of comparable Norris locomotives. The color scheme is based on paint sample research on the locomotive during restoration for the California State railroad Museum, Norris advertising lithographs from the 1850s, and a written description by H. C. Caruthers of a Norris engine delivered to the Pennsylvania Railroad in 1861. From: "Heather Lawson" lawsonfam3@yahoo.com How Much Per Foot Does A Steel Railroad Rail Weigh. I'm Real Interested To Know. Thought you might find this on-line inflation calculator helpful for converting historical dollar amounts into modern terms.